Are you a cyclist impatiently waiting to get back on the road or trail? Or are you looking for something new to add to your fitness routine? Give indoor cycling a try! This low impact class builds strength, endurance and cardio fitness in a fun group setting. Bring a friend in February – they’ll get a free one week pass to sample indoor cycling and other group exercise classes. 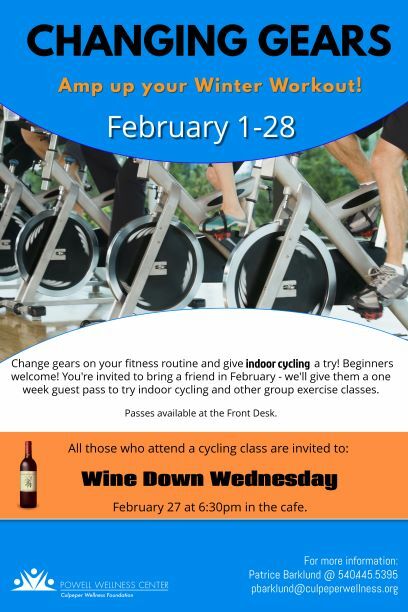 Celebrate your active month on February 27 with Wine Down Wednesday – everyone who has sampled an indoor cycling class is welcome! Our dedicated cycling studio hosts 10 classes weekly, with the convenience of morning and evening sessions to choose from. Check the monthly group exercise schedule for details.